I'm sure most of you have seen other bloggers post about Persunmall by now, so you probably understand why I jumped at the chance to work with them when they contacted me recently. With such a large selection of light button downs and sweet dresses, I could have easily included the entire store on this wishlist. Unfortunately I had to narrow it down (mostly to keep my sanity). These are the things I'm lusting after at the moment, but make sure to head over to Persunmall for plenty of other adorable options. I've actually never heard of them, so this is really cool! I LOVE the cat print skirt. I love that horse print dress too. Such a cute print! The polka dot dress with the scallops is perfect too. It must be brand new on the site because I feel like I just scoured the whole thing two days ago! I am digging the kind of retro vibe from #5 skirt - the pleats make it! 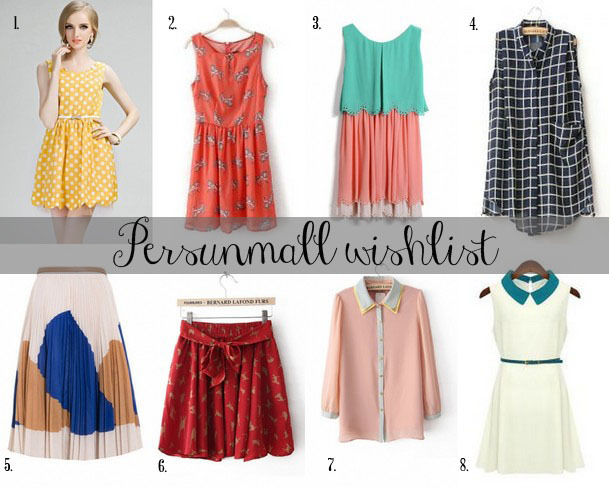 Oh man...I've seen these posts about Persunmall going around, and I must say, they have awesome stuff! This is sooo cute! I love the cat print skirt. And the polka dotted dress. No but seriously, everything is awesome. So cute. I have the second dress (with the merry go round horses), from another site -- but it desperately needs the zipper replaced, since the quality is pretty poor. But I really like their site! Great picks! Ooh I love that little red skirt! I also nearly bought that merry go round dress but then it had really bad reviews so I kept away, it looks amazing though. It's the kind of item you want to just get regardless and assume they're all wrong.